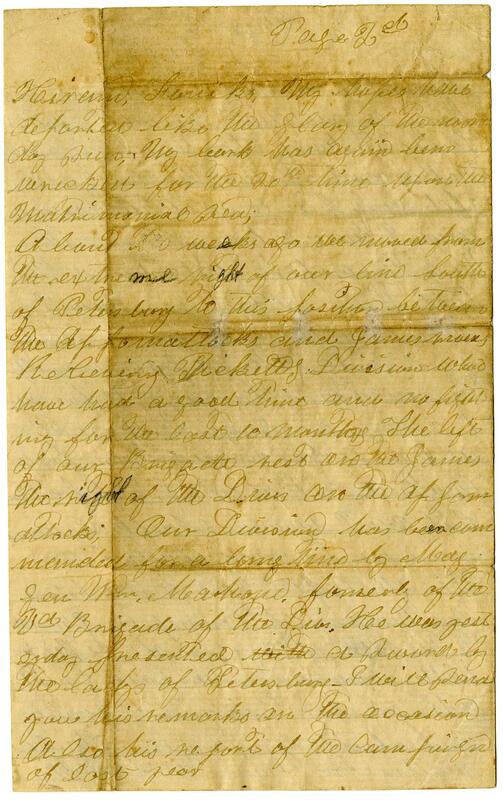 Item Description: Letter dated 24 March 1865 from William C. McClellan to his brother Robert A. McClellan. He discusses hearing from family in Alabama and the declining health of their parents. He also mentions about conditions at Petersburg and how he feels the end of the Confederate States is near. He lastly writes about how he feels Robert E. Lee is the greatest military commander in the history of the world. 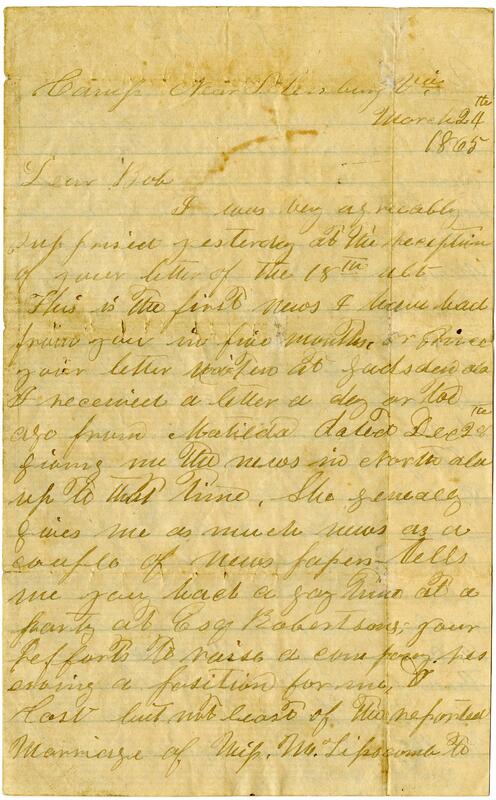 I was very agreeably surprised yesterday at the reception of your letter of the 18th inst. This is the first news I have had from you in five months or more your letter written at Gadsden ala I received a letter a day or two ago from Matilda dated Dec 28th giving me the news in North Ala up to that time. She generally gives me as much news as a couple of news paper tells me you had a gay time at a party at Esq. Robertsons; your efforts to raise a company haveing a position for me, & last but not least of the reported marriage of Miss M. Lipscomb to Hiram Faulks. My hopes have departed like the glory of the noonday sun. My heart has again been wrecked for the 20th time upon the matrimonial sea. About two weeks ago we moved from the extreme right of our line South of Petersburg to this position between the Appomattocks and James river. Relieving the Picketts Division who have had a good time and no fighting for the last 10 months. The left of our Brigade rest on the James The right of the Divis on the Appomattocks; Our Division has been commended for a long time by Maj. Gen Wm Mahone fomerly of the 3d Brigade of the Divs. He was yesterday presented with a sword by the ladys of Petersburg. I will send you his remarks on the occasion also his report of the campaign of last year. Somehow or other I have been thinking a great deal resently about those at home, particularly about Father and Mother. They are getting old and feeble as Mathilda says and I have a longing to be with them to comfort suport and Protect them. ? you and I will fall this duty for this reason you must not expose yourself to unnecessary danger. As for me I am in no danger at presant as I now hold and have for a longtime a Boom proof position but I would gladly exchange for your Branch of services. We all expect here to see before long the army of Tennessee joined to the right of the army of VA. Then will commence the last great strugle for Richmond. Grant is perfectly quiet he seems to be waiting for Sherman to win all the glory. You will excuse me for saying that Grant has had to contend with the greatest Gen the world ever produced. Napoleon not ? the later was sometimes defeated with equal numbers, the former with overwhelming odds against him. No matter if our country goes down tomorrow Lees name will stand first upon the pinnacle of fame, as the greatest of commanders living or dead. If your army was not on the move I would apply for a few days leave of absence to pay you a visit but under the existing circumstances would be doubtful about finding you. Bob I am low down I can see but little hope for these confederate states in these times. My kindest regards to all the boys. Write every opportuy possible. 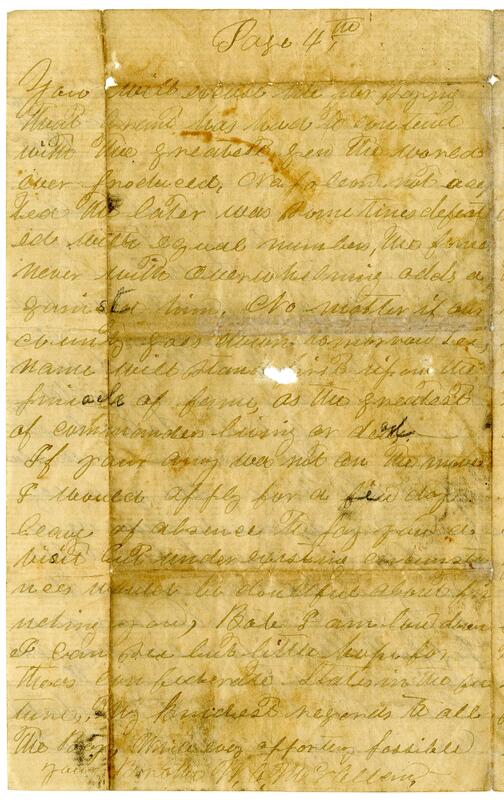 This entry was posted in Southern Historical Collection and tagged Civil War, family concerns, General Robert E. Lee, health, Petersburg (VA), William McClellan. Bookmark the permalink. Towards the end of the first paragraph, my hopes have departed, not gave departed, and my heart has again been wrecked, not wreaked. 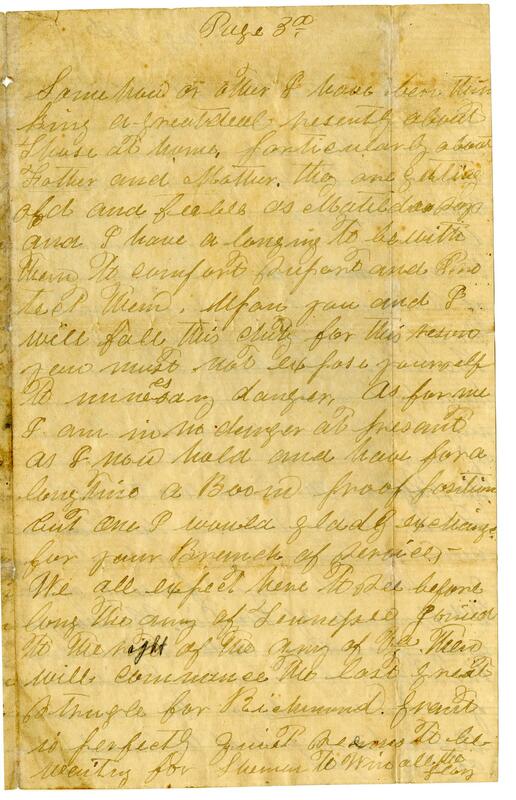 Third paragraph: “Upon you and I will fall this duty”.